Date: Nov 2012 i Previous editions(s) can be found in the Related Items tab. At a time when the SEC, FINRA, and state authorities are putting increasing regulatory pressure on the securities industry, Variable Annuities and Variable Life Insurance Regulation remains today’s most comprehensive and accessible guide to the many federal and state rules governing these instruments. Every key area is addressed to clarify professional duties and compliance responsibilities, from product design, approval, administration and distribution, to marketing, inspections, and special investment products, including private placements and offshore investment products. tax treatment of hedges that variable contract issuers use to manage liabilities for minimum guaranteed income, cash value, or death benefits under variable contracts. 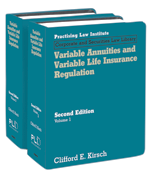 Updated at least once a year, Variable Annuities and Variable Life Insurance Regulation is a vital reference for securities professionals and attorneys, compliance officers, federal and state regulators, general practitioners, and investors.